Amalgam separators are used to remove the mercury out of the dental wastewater before it enters the city’s sewer system. Without an amalgam separator, the average dentist will release roughly three pounds of solid mercury per year. Mercury amalgam, being more dangerous than standard mercury because it contains 4% tin, which has an ionic charge that will release the mercury into its free state. If this mercury amalgam is submerged into a liquid, it creates soluble mercury, a substance that your local water treatment plant cannot capture with current technology. A Dentist with a LibertyBOSS has made the conscious effort to be more environmental by installing the only amalgam separator to be rated as “Best Available Technology” and “Environmentally Friendly.” The M.A.R.S. 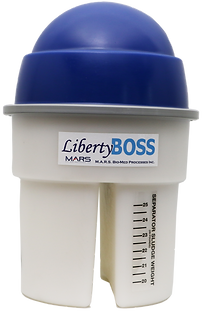 LibertyBOSS amalgam separator is able to capture all forms of mercury, including soluble. This assists in making your Doctor’s practice more environmentally friendly than other practices who chose to use other types of amalgam separators or have not yet installed one. The “BOSS” is designed for precise performance, time-saving convenience, simplicity and environmental compliance, without the costs involved with messy filter or cartridge changes, added recycling and service costs. M.A.R.S is committed to developing products and solutions that not only help dentists and the public but help the environment, beyond what is being required by environmental laws.